Any bookings made online are not valid until the deposit has been deducted from your credit card. While every effort is made to ensure that the information available and provided from the property is correct, we cannot guarantee that they are free from errors or faults. Tariffs are subject to change without notice. Where a booking has been confirmed by the receipt of a deposit, the tariff quoted will be honoured. To confirm a booking, a deposit of $200 is taken at time of booking. Outstanding balance is to be paid in full on arrival. Booking dates can be altered subject to availability and at the discretion of Management without penalty (excluding Special rates and advance purchase). Accommodation rates will be adjusted accordingly. If cancelled up to 14 days before date of arrival, a full refund will be given. If cancelled 14 days or less, the deposit amount of $200 is forfeited. In the case of a no show, the total price of accommodation will be charged. One older child or adult is charged AUD $30 per person per night in an extra bed. Guests are required to leave apartments in a clean manner or you may be charged for extra cleaning at the discretion of Management. Guests will be held liable for any damage to, or losses in the apartment. Management will endeavour to grant any requests made by a guest however these requests cannot be guaranteed. WiFi is available in the hotel rooms and charges are applicable. Payment via credit card. Free secure parking on site. 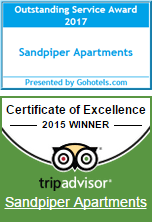 On behalf of Sandpiper Broadbeach, we would like to thank you for choosing to book your accommodation with us and we look forward to welcoming you.